Trains returns with all-new cards and strategies for you to build the best rail system in Japan. 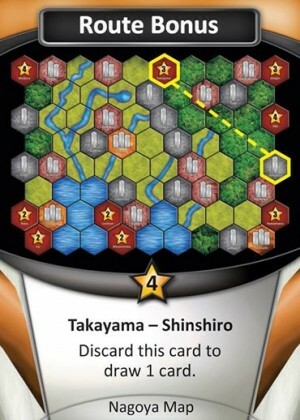 Trains: Rising Sun not only features all new cards, it includes three entirely new boards. Two of the boards are designed specifically for two-player games, while the Nagoya map is for 2 to 4 players. This standalone game can mix easily with the original Trains game for even greater replay possibilities! Trains: Rising Sun is a standalone game that builds upon it’s solid predecessor Trains in fantastic way. It’s still a deckbuilder about managing your train network, but adds more cards that enhance gameplay and provides more options that makes network building even more important. Can mix it with the original Trains! The overall gameplay of Trains: Rising Sun hasn’t changed from Trains, so I won’t repeat it here. Just please refer to Trains to see my overview. However, Trains: Rising Sun adds so much more that enhances the existing gameplay greatly. The first thing it adds is the Route Bonus cards. This is probably the most important addition to the game. The Route Bonus cards add purpose to building your network between certain cities and enhance the theme of the game. They provide bonus points for connecting target cites on the route and provide a “special power” if you choose to use them after claiming them. The publisher also provides Route Bonus cards for the previous Trains and all the maps they have produced so far… awesome! Also, attack cards are added that provide more direct interaction instead of just multiplayer solitaire. Most of them mess with other players hands. This could be a con for some, but you don’t have to play with them. The victory point cards have more interesting scoring bonus instead of just straight points on the cards. There are also more ways to manage the waste in your hand, and more trains that combo with other trains. The last great addition is the two player maps! This makes for tighter and more strategic gameplay for two players, which was missing in the original more “expansive” maps. The resources are tighter as well, since the rules set you up with less stations, cards, and rail tokens. This was a much needed addition to the game. I originally rated Trains a 10, but given this addition, I’ve had to adjust my score. Rising Sun is what Trains should have been the first time. I love almost everything they’ve added to the game. It improves the original game in just about every facet even the deck cycle problem by providing more scoring options and direct interaction. If you’re looking to get into Trains, you should start here. If you already have Trains and like it, you must get this! A question you may ask is “If I don’t have Trains, and buy Rising Sun, should I get the original Trains?”. I would say yes if you find yourself liking Rising Sun. If you don’t like Rising Sun, then you probably shouldn’t look into Trains. However, if you didn’t like Trains, you might want to give Rising Sun a chance. It really is better. I heartily recommend this version of Trains! 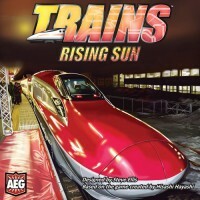 Add a Review for "Trains: Rising Sun"